Is VR the future of online communities? You might look at a virtual reality (VR) headset, like the HTC Vive or the Oculus Rift, and associate it with the best VR games – and you wouldn't be off base. However, with the rise of Windows Mixed Reality headsets and the launch of the Oculus Go, the future of VR rests predominantly in the community experiences it accommodates. There are definitely already VR communities and social media experiences in 2018, but they’re largely still in infancy. However, we can look at how online communities look in 2018 – both through VR and not – to get a glimpse at what the future holds. In an age when we’re constantly reminded of the potential harm that networks like Facebook inherently hold, both on a personal and a societal level, it can sometimes be hard to look forward and imagine what the future could look like. But, that’s precisely what we’re going to do, because we want to see technology make the world a better place for everyone. What do online communities look like today? Even outside of VR, online communities are extremely diverse in 2018. Whether it’s traditional social media, like Facebook or Twitter, focused on gaming, like Discord, or even older networks like Reddit – all of these online communities serve different purposes but are still extremely unique. Online communities bring people from all walks of life together, all sharing ideas and moments of their lives with each other. And, when it comes to gaming, a lot of these people are gathering together in virtual places like Discord, both typing out messages and chatting with each other over VoIP (voice over internet protocol). And, while so many different ideas can be exchanged and so many connections made, there’s still an alienating effect these social media services can have on users. Later, she stated that people gauge the success of their messages by the amount of reactions it gets online – something that’s unique to social media. This isn’t to say that traditional social media is inherently harmful – it just stimulates users in a different way. As with all things, moderation is the key. What do VR communities look like today? Communities in VR have only been around for a comparatively brief amount of time. But, the differences in how they function are already readily apparent. One of the most popular community platforms in VR today is Oculus Rooms for the Oculus Go and Rift, which can gather together a small group of friends in a virtual space, playing games, chatting or even watching videos together. Now, this obviously isn’t on the same scale as something like Facebook, but that doesn’t mean wider networks don’t already exist. 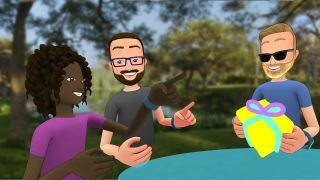 Microsoft’s AltSpaceVR is a much larger platform that lets users participate in live events, and even hold meetings with unlimited attendees. This is obviously much bigger, even if it’s still not quite as big as Facebook. The key difference here is in how you’re interacting with people. Rather than talking anonymously through a computer, you’re interacting with people directly – even if what you’re actually seeing is a virtual representation of the other person: an avatar. In an interview with Public Radio International, Jeremy Bailenson, director of Stanford’s Virtual Human Interaction Lab, said that VR “takes all the gadgets away” and makes you “actually feel like you’re with someone.” You can perceive the actual emotional response of the people around you. This is how virtual reality can more closely resemble how people communicate in the real world, facilitating more natural modes of conversation. It’s still in its early stages, to be sure, but the idea of communities that rely on legitimate reactions and organic conversation, rather than the quantitative method of collecting likes on Instagram. The future of community building in VR is therefore extremely exciting, and nothing is set in stone. But, largely the future of VR is going to be in its social capabilities. The promise of social media – a place where people from around the world can get together and share ideas and, well, socialize – could be fully capitalized on through VR. The next hurdle is most likely going to be the accessibility of VR headsets. Devices like the Oculus Go and even the Google Cardboard – even if that doesn’t provide the most compelling user experience – are going to drive the future of community in VR. If everyone can get their hands on a wireless headset, it’s only a matter of time before the next Discord takes over the world through VR. As soon as a compelling social network or community is built on VR, people will flock to be part of it. If you want to get in on the ground floor of this movement, check out Oculus Rooms and AltSpaceVR.